The purpose of this post is to describe a bit about how the 2D collision detection works in Juggernaut. Some of it may be overly basic, and some bits may skip massively over other aspects, but it does cover a few points (particularly on convex object collision detection) that I didn't find directly anywhere else on the web, and should at least provide a good overview. 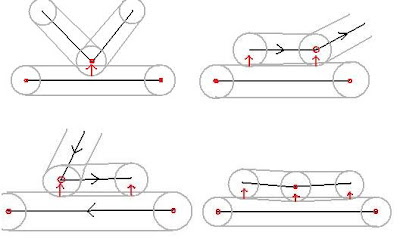 In order to integrate a shape into the physics engine, you need to be able to detection intersections between that shape and the others supported by the collision detection engine. 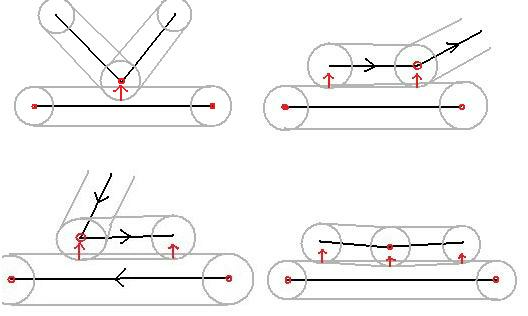 Up until now, Juggernaut has only properly supported circle/circle and circle/line interactions: the main world brush is defined by a series of straight lines (organised into a hierarchical tree structure for efficient collision), and the objects themselves are defined by a series of bounding circles. 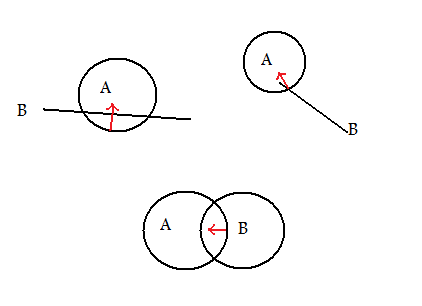 These are the simplest types of collision, as there is only ever one possible contact point between the primitives (to clarify, circles can have two actual intersections with a line/other circle, but only a single contact point is required to resolve them). A very rough image showing example contact points/normals for circle/line and circle/circle collision detection. By convention, the normals are defined as pointing into object A. 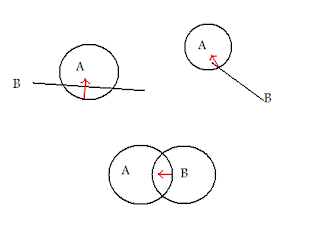 A contact point is defined by the intersection point between the two objects, the collision normal, and the penetration depth. The circle/circle case is the simplest, as you just take the vector between the two circle centres and compare the magnitude to the sum of the radii. For the line/circle case you need to create the function closestPointOnLine( Point A, Line B ), which will determine the closest point on the line segment B to the point A, which may either be a point along B or one of the endpoints of B. Intersection/non-intersection may then be determined by comparison of the distance of the circle centre to the closest point on B with the radius of the circle. For a more in-depth look (including the actual maths) this site is a very useful resource. So, for the simple primitive case, the contact point information can be calculated directly. However, what if we want to have a more complex shape, such as an arbitrary convex polygon? Convex polygons are selected as dealing directly with non-convex polygons is much more difficult, and it is always possible to decompose non-convex polygons into multiple convex polygons. In this case, working out whether the objects intersect is much more difficult, and a naive approach would probably involve comparing every edge in shape A with every edge in shape B. Luckily, this is not necessary! - The Minkowski difference (see here). - Alternatively to GJK, a Separating Axis Theorem-based approach such as the Lin-Canny algorithm. - The Expanding Polytope Algorithm, which may be used in conjunction with GJK in order to improve performance on deep penetrations. The Juggernaut convex shape handler is based around GJK, and I'll mention a couple of things that I've found about it. It works absolutely amazingly for determining whether objects intersect or not. If the objects *do* intersect, the raw GJK results can be unreliable, as the closest simplex edge won't necessarily correspond to an edge on the convex hull of the Minkowski difference. To ensure that this always happens, you'll need to use the Expanding Polytope Algorithm in these cases for robust behaviour. Both Shape A vertices are identical and the Shape B vertices define an outside edge of B. Both Shape B vertices are identical and the Shape A vertices define an outside edge of A. Both the Shape A and Shape B vertices define outside edges of A and B, respectively. This will only really occur when the edges are very close to parallel, and can also be associated with a triangular simplex of zero are. Also, this may or may not occur in exactly the same situation depending on the initially selected simplex point. The vertices do something else and define non-external edges of A and/or B (may happen with raw GJK, but not GJK+EPA). When there is only a point/edge interaction, both cases 1 and 2 are simple to solve as the intersection point occurs on the point of whichever shape, and the normal is defined by the edge normal of the other shape. However, if an edge/edge interaction is going on, this will lead to only one contact point being found rather than 2, causing jittery behaviour. Dual-edge checking collision point calculation, showing the possible basic configurations for 1, 2 and 3 point contacts. The red vertices show those that form the closest Minkowski difference edge, as returned by the GJK algorithm. The grey outline show the outlines of the capsules produced by the edges, and the red arrows the intersections/normals. Note that this figure skips the situations where the endpoints of the lower shape edge come further in than the outer ones of the upper one.